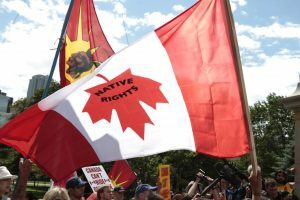 Taking advantage of Canada’s spot on the world stage this week, about 1000 Aboriginal protesters took to Toronto’s streets to protest the G8/G20 economic summits. CBC News made a point of emphasizing that the protest was peaceful, while the Toronto Star focussed on why the march took place and who was involved. The Globe and Mail had an interesting article about how the first detainee of the so-called “protester prison” was an Ojibway activist named Mark Corbiere. It was by far the largest protest of the G8/G20 summits and photographer Scott Stephens (Ojibway) was there (that’s his image on top). We’ll have more of his work in an upcoming post. « POLL: Should Canada’s Next Governor General Be Aboriginal? This is great. At least, there are people who are still willing to fight together for their rights. Thanks for sharing the news here .